In the spring of 1996, Gregory Jenkins passed the torch of the family business to his youngest son. Gregory had owned his own general contracting business for as long as he could remember. After suffering a debilitating injury in 1995, he looked to AJ the youngest of 4 boys to carry out the lessons that he had learned as a child during the 80’s working alongside his 3 older brothers and dad. Gregory taught them everything from painting, tiling, cabinetry, hardwood floor installation, staining, framing…….you name it. AJ decided that he would find a way to redefine his father’s dreams and objectives for the business. 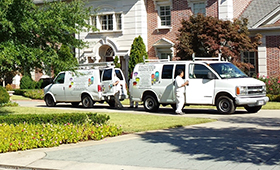 12 years later Duluth Friendly Painting and Contracting Services has served over 300 clients in the Greater Atlanta Area, with services ranging from painting one child’s bedroom, to painting a 220 unit assisted living community! Thanks to you we are growing.